Air France has released details of the chefs which will design its business class and La Premiere (first class) menus in 2019. The carrier will partner with a total of seven Michelin-starred chefs on long-haul flights departing Paris, who will �help design the menus, choose the products and create the recipes�. In La Premiere, passengers will be offered dishes by Michel Roth � two Michelin-starred chef and owner of The Bayview Restaurant in Geneva � between January and March. These will be followed from April to June by creations by the late Joel Robuchon, who died in August 2018, as Air France honours the memory of �a visionary and virtuoso chef�. From July to September LA Premiere customers will be offered dishes by Regis Marcon, owner of the three Michelin-starred restaurant Le Clos des Cimes in Saint-Bonnet-le-Froid in the Haute-Loire. Finally between October and December first class passengers will be treated to dishes by the three Michelin-starred Emmanuel Renaut, founder of Flocons de sel in M�g�ve in the Haute-Savoie. Meanwhile in business class three Michelin-starred Anne-Sophie Pic � who opened La Dame de Pic London at the Four Seasons Ten Trinity Square in 2017 � will create dishes between January and March. This will be followed by menus by three Michelin-starred Arnaut Lallement between April and June, and Guy Martin of Le Grand V�four in Paris from July to September, before Michel Roth then creates dishes for the business class cabin between October and December. First class travelers leaving from New York (JFK), Los Angeles (LAX), or Washington D.C. (Dulles) may order Boulud-created meals like Atlantic lobster with curried coconut sauce and bok choy; Provencal lamb chops with zucchini pesto, tomato, and cheese polenta; and sea bass in vine leaves with za�atar, farro, and grapes. Meanwhile, those seated in business class and departing from Atlanta, Boston, Houston, Washington D.C., New York, Los Angeles, Miami, San Francisco, and Detroit may find their menu features one of these Boulud dishes: salmon with fennel, chickpea, and sumac; moroccan chicken tagine with lemon, cauliflower, and couscous; or braised lamb with spring root vegetables and edamame. Even though the Boulud specials will only be available in first and business class, Air France has not forgotten about those in the back of the plane. Top Chef France winner Jean Imbert designed a la carte spreads for economy and premium economy travelers on long-haul flights departing from Paris. These meals will be available starting April 1 for $23 as an upgrade to the standard economy meal offering, and include items like a cold starter with organic quinoa, a poached egg with tarragon, and a fruit-filled pastry for dessert. The Vancouver Airport Authority expects the new direct Paris-Vancouver flight service will be a boost not only for YVR and Air France, but for Metro Vancouver. The service is expected to generate around $13.7 million in gross domestic product and $8.8 million in wages to the B.C. economy, according to Vancouver International Airport. For travel agents who specialize in European vacations, Air France�s flights from Vancouver to Paris have been a long time coming. The last year-round direct flights to the French capital were offered by Air Canada and ended in the late 1990s, according Kerry McKeen of France Bound, a Vancouver-based agency focused on vacation rentals. Scheduled service between Vancouver and Paris will operate three times a week until May, when it will expand to five times a week for the summer. Air Transat also offers some non-stop charter flights between the two cities, but only during summer months. As the Air France Boeing 777-200 taxied minutes after landing, small French and Canadian flags waved from the cockpit windows for members of the media filming on the tarmac in wet and windy weather. Inside the terminal, a celebration was warming up, as passengers enjoyed food (croissants, baguette sandwiches and an Eiffel Tower-shaped cake), and entertainment (in the form of a mime, an accordion player, and a DJ playing disco and classic French tunes). Air France has confirmed that Abidjan, the capital of C�te d�Ivoire, will be the second destination in Africa to be served by its Airbus A380 fleet after successfully operating a one-time service to the city�s F�lix Houphou�t-Boigny International Airport in January 2014 to mark the hosting of the International Forum for Investments in the city. The European flag carrier already uses the Super Jumbo on its Paris � Johannesburg route. During the 2014/2015 winter schedule from October 26, 2014 until March 28, 2015, Air France will deploy the A380 on three weekly rotations between its Paris hub and Abdijan. The route will be flown on a daily basis and the remaining four flights will be operated, as present, by a Boeing 777-300. The flight operates during daylight hours to Africa and returns to Europe overnight. The use of 516-seat (9 seats in La Premi�re, 80 seats in Business, 38 seats in Premium Economy and 389 seats in Economy) A380 into the country will boost seat capacity in an important market for Air France. With a strong level of growth, the C�te d�Ivoire aims to become the main hub and gateway to West Africa, a market representing over 300 million inhabitants. The news is no real surprise as when Air France announced its one-time A380 charter to Abidjan it revealed its intention to serve the African destination with the type on a scheduled basis. As our analysis below highlights, bi-directional O&D demand between Paris and Abidjan increased by almost a quarter in 2013 (up 23.5 per cent versus 2012) but traffic levels are still down on the peak years between 2006 and 2009 when traffic exceeded 200,000 bi-directional O&D passengers. Kuala Lumpur, Jakarta and Singapore: these are the three capitals in Southeast Asia which will benefit from an increase in seat capacities by French air carrier Air France between now and June. PARIS - Air France increases service to South-East Asia as the airline wants to capitalize on strong economic growth in this part of the world. As Garuda announced to join the Skyteam alliance, Air France is now looking to add Jakarta from the end of March to its network. With larger capacity aircraft and increased flight capacity during the 2014 summer season, Air France is increasing its service to Kuala Lumpur. Spurred by the successful launch of this destination in April 2013, the Company is increasing its service to the Malaysian capital. In January, Air France is increasing by 25% its capacity to Kuala Lumpur. This destination is now served by Boeing 777-200 equipped with a new "leisure" configuration offering additional seats for customers. The aircraft offers a seat capacity of 309 seats (35 in Business class, 24 in Premium Economy and 250 in Economy) compared with 246 when this frequency was first launched. Starting on 16 June 2014, Air France will also launch an additional frequency between Paris-Charles de Gaulle and Kuala Lumpur. The Company will thus offer customers four weekly flights, providing them with greater flexibility to organize their trip. Throughout the 2014 summer season, Air France is increasing its flight capacity to Singapore-Changi airport. From 17 June to 30 August 2014, the Company will operate 10 weekly flights and two different flight times for its customers. In addition to the daily Air France flight between Paris and Singapore, additional flights will be operated by Boeing 777-200, with a capacity of 247 seats, including 4 in La Premiere, 49 in Business, 24 in Premium Economy and 170 in Economy. Starting 30 March 2014, Air France's daily flight to Singapore will also continue on to Jakarta. Flights will be operated by Boeing 777-300 equipped with 303 seats, including 8 in the La Premiere cabin, 67 in Business, 28 in Premium Economy and 200 in Economy. This new destination will complement the flight schedule offered by KLM, which serves Jakarta on a daily basis from Amsterdam-Schiphol. On both the outbound and inbound flights, all Air France flights to Singapore and Jakarta will leave in the evening, enabling passengers to rest during the night. Moreover, in Singapore, Air France customers wishing to travel to Bali can easily take a connecting flight on the daily KLM Singapore-Denpasar service. For the winter 2013-2014 season, Air France-KLM serves 23 destinations with more than 200 weekly flights between Europe and Asia via the hubs at Paris-Charles de Gaulle and Amsterdam-Schiphol: Bangalore, Bangkok, Beijing, Chengdu, Delhi, Bali, Fukuoka, Guangzhou, Hangzhou, Ho Chi Minh City, Hong Kong, Jakarta, Kuala Lumpur, Manila, Mumbai, Osaka, Seoul, Shanghai, Singapore, Taipei, Tokyo, Wuhan and Xiamen. La Compagnie plans to begin service in July with one B757-200 plane. La Compagnie, a new business-class only airline in July plans to start flying its single plane between Paris and Newark, New Jersey. The airline will lease its plane from Icelandair, and that airline will serve as a back-up if La Compagnie's plane is ever out of service, company officials announced Tuesday. "It is not the same model as has been tried before. It is not a deja vu," La Compagnie co-founder and Deputy CEO Peter Luethi said Tuesday morning at a press conference in New York announcing the launch. "It is not going to be the most luxurious business class, but it will be the best for the price." Pending approvals from French and U.S. government agencies, La Compagnie aims to start flying July 11 from Paris' Charles De Gaulle Airport Terminal 1 to Newark Liberty International Airport's Terminal B, Luethi said. The plan is to fly six round trips per week by September and move to seven days per week in November, with a day off every other week for maintenance, Luethi said. Icelandair, which had to cancel flights Tuesday due to a mechanics strike, will handle regular maintenance of the La Compagnie aircraft and back-up service. That back-up service might need to route through Iceland, if the business-class only plane is out of service, Luethis acknowledged. A second aircraft is on order for December, and it will either add service on the same route or add service to another European business center, Luethi said. That plane will be leased by DreamJet, the operating company for La Compagnie. Plans call for more cities down the line. The company's 42 investors, mainly from France and other European countries, have put up equity amounting to 30 million Euros, Luethi said. They see a customer base of about half a million passengers mainly of individual entrepreneurs, small businesses, midsize companies and some leisure travelers. The "tech-driven" airlines will offer wi-fi by "the later part of the year" will and provide French- and English-language entertainment on Samsung Galaxy Tablets that can be undocked at each seat, Luethi said. There will also be USB ports and power outlets at each seat, plus the option of mobile check in. The 74 seats, configured two on each side of a central aisle, will lie flat and will be 26 inches wide. Passengers will have access to TSA priority screening. 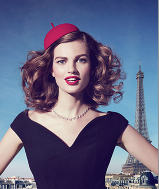 PARIS - Out for the ethereal, almost poetical campaign of Air France dating back to 15 years - Making the sky the best place on earth-, Air France unveiled in world exclusivity yesterday in Paris its newest advertising campaign. Daring to be different, the new campaign highlights the willingness of the carrier to be perceived youthful, dynamic and energetic and at the same time very French in its essence. �We are in France very �Frenchsceptical�. But I can assure you that this image is not what most foreigners perceive or see when thinking of France. Our country is one of the strongest image-generating destination and we wanted to play with all the cliches and icons shaping France�, explained Remi Babinet, one of the cofounder of BEPC, the advertising agency which stands behind the new Air France tagline and campaign. �Our aim was then to offer a dramatic different image, far from the normal image campaigns emphasizing always the flight attendant smile or aircraft�s cabins�, said Mr. Babinet. 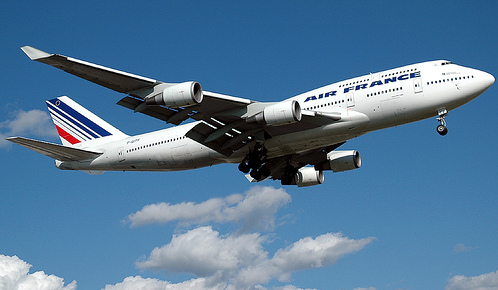 � Air France, France is in the air � is daring to be different to carry the ambitions of the Transform 2015 Plan. � Transform Plan has been essentially centered on economic efficiency and cost improvement in its first application phase. We now want to improve our revenues and our communication by also highlighting our new commercial offer and our ambition to be a world leader for service quality�, toldFrederic Gagey, the airline CEO. The new campaign consists of 6 visuals illustrating the services offered by Air France: the comfort of the A380, the new La Premiere cabin, the new Business cabin, gastronomy, the carrier�s network and SkyPriority (priority channels at more than 1,000 airports). It is supplemented by 12 visuals depicting iconic destinations served by Air France (Paris, New York, Brazil, China, Japan, Africa, Italy, etc.). In total, some 38 to 40 visuals were created for the campaign. The visuals, created by the Argentine photographers Sofia & Mauro, create an effect of surprise by mixing heritage and modernity, while echoing Air France�s past as a renowned poster specialist. Pleasure, youth and vitality emerge from images of the Moulin Rouge, the French Revolution, the Sun King, master chefs and haute couture. The airline�s eminently French character and the notion of the pleasure of travelling with Air France are illustrated in a fun, lively and exciting message, in line with the French lifestyle. The bright and offbeat tone creates a form of affinity and proximity with the public.